Today Bushiroad USA has put out a press release detailing their plans for 2013, bringing with it the formal announcement of WCS2013 as well as its European and Asia-Oceanian branches. Careful reading of the press release also reveals a new trial deck, "Extra Trial Deck EXTD-01" which will "contain exclusive deck accessories for both new and veteran players". Some speculate that EXTD-01, scheduled to be sold during the 2013 holiday season, may be a counterpart to the VG-DG01 DAIGO Special Set, but Bushiroad has kept quiet about the matter. Surprisingly, Bushiroad has also announced that VGE-BT11: Seal Dragons Unleashed, which was previously slated for a December 13th release following VGE-BT10: Triumphant Return of the King of Knights on October 25th, has had its release date swapped and will be released on October 25th while BT10 will instead come in December. Producer of the English-language Cardfight!! Vanguard TCG cited "production and operational issues." This may be a move to prevent Dragonic Descendant from gaining the same dominance in the English format that he held until recently in Japan, as BT10's new release date is outside the bounds of the now-confirmed dates for World Championship 2013 while before it would have been released prior to the finals in November. Singapore (July 7, 2013) – Bushiroad announced the official logo and qualifying structure for the upcoming Cardfight!! 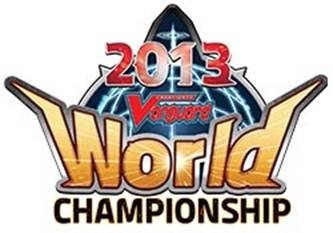 Vanguard World Championship 2013. Similar to the first ever World Championship held in 2012, open national qualifiers will be held in the regions of North America, Europe and Asia-Oceania. These qualifiers are scheduled to be held in September and October 2013. The finalists from the qualifiers will face each other in their respective continental championships in November 2013. The continental representatives will then battle for the World Championship 2013 title in December in a currently undisclosed venue. A new Cardfight!! Vanguard product under the working title, Extra Trial Deck EXTD-01, was also revealed at the conference. This premium trial deck gift set will contain exclusive deck accessories for both new and veteran players and is expected to be sold during the festive seasons at the end of 2013. Bushiroad also announced changes to the release dates of Booster Pack Vol. 10 and Booster Pack Vol. 11. Mr. Shunichi Taira, producer of the English edition Cardfight!! Vanguard, cited that the changes were made due to production and operational issues. Booster Pack Vol. 11 Seal Dragons Unleashed was brought forward to October 25, 2013. Booster Pack Vol. 10 Triumphant Return of the King of Knights will be available from December 13, 2013. Bushiroad revealed more information about the new license, “Future Card Buddyfight,” that was previously unveiled in June 2013. The rules are easy to pick up, and players will be able to learn the rules by watching the TV animation. Players can choose their favorite monster to be their ‘Buddy Monster.’ Monsters from different worlds in Buddyfight allow players to bring different strategies to the game. Bushiroad USA Inc. and Bushiroad South East Asia Pte Ltd will provide support during the simultaneous release of the Japanese and English editions of Future Card Buddyfight in January 2014. The Future Card Buddyfight license will be heavily promoted through comic serialization and animation. Comic serialization begins from Winter 2013 in Shogakukan’s “CoroCoro Comic.” The TV animation will be released in Japan in early 2014, with the animation done by OLM Inc., the animation studio behind the Pokémon movie series and “Inazuma Eleven.” Bushiroad has also announced plans to air the English-dubbed animation in Singapore, Malaysia and on YouTube.